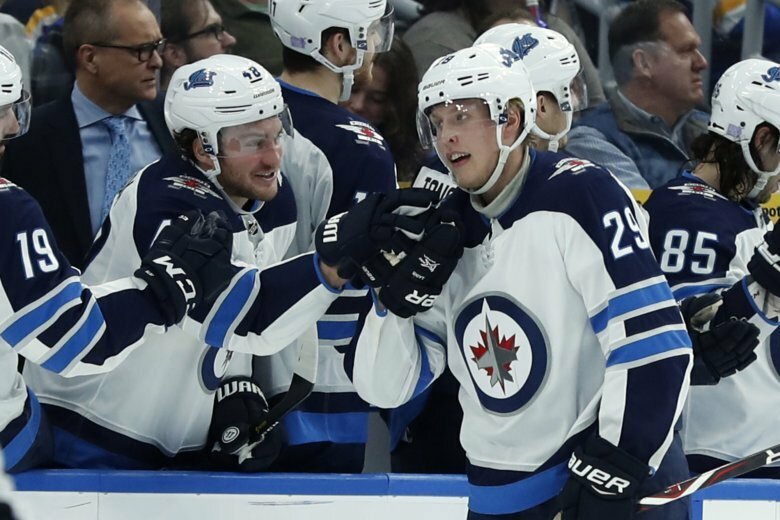 ST. LOUIS (AP) — Patrik Laine never envisioned challenging the NHL’s single-game scoring record. Winnipeg coach Paul Maurice did not share in his young winger’s modesty. Laine recorded the 61st five-goal game in NHL history Saturday night as the Jets’ defeated the St. Louis Blues 8-4. Laine didn’t share his coach’s confidence. The last player to score five goals in a game was Johan Franzen of the Detroit Red Wings on Feb. 2, 2011. Darryl Sittler of the Toronto Maple Leafs was the last player to score six goals in a game, on April 22, 1976, against Boston. Joe Malone, who played in the early days of the NHL with the Montreal Canadiens, scored seven goals in a game with the Quebec Bulldogs in January 1920. He also had a six-goal game and three five-goal games. Brandon Tanev, Blake Wheeler, and Brandon Lemieux also scored for the Jets who snapped their first two-game losing streak of the season. Laurent Brossoit allowed four goals on 27 shots for his first career win against St. Louis. He improved to 4-1-1. Chad Johnson allowed six goals on 25 shots and fell to 2-5-0. He was pulled in favor of Jake Allen after allowing his sixth, and Laine’s fourth goal of the game. Allen stopped nine of the 11 shots he faced in relief. Laine’s five goal outburst gives him a league-leading 16 goals in 10 November games and 11 in his last four contests. Laine’s line mates, Bryan Little and Kyle Conner, combined to assist on four of Laine’s five goals. Laine scored his first goal 16:26 into the first period when he buried a feed from Little just 41 seconds after Wheeler tied the game 1-all with his fourth goal of the season. Tarasenko tied the game 2-all 1:24 later, when he snapped a 10-game streak without scoring a goal with his seventh tally of the season. Laine’s second goal came on the power play with Vladimir Tarasenko serving a two-minute penalty for roughing and put Winnipeg up 3-2. Laine completed his seventh career hat trick and third of November when he beat Johnson 12:53 into the second period. Blues defenseman Joel Edmundson fought Tyler Myers shortly after Laine’s third goal, but that did nothing to change the tide as Laine netted his fourth goal later in the period. Laine netted his fifth of the game when he pushed a feed from Little past Allen, becoming the 45th player in NHL history to record a five-goal game. Perron, Ryan O’Reilly, and Pat Maroon also scored for the Blues who have not won consecutive games since defeating Carolina and San Jose on Nov. 6 and Nov. 9. NOTES: Blues LW Brayden Schenn skated in his 100th game with the team. . Perron scored his first goal in 14 games. .. Jets RW Blake Wheeler skated in his 800th career NHL game. .. Laine’s has scored 13 goals in 11 career games against St. Louis. Blues: At Detroit on Wednesday to start a three-game road trip.